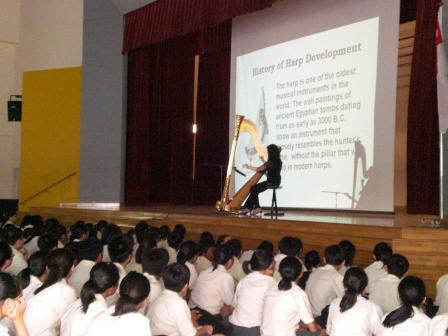 Magdalene Wong has been conducting the “Harp Appreciation” programme for Singapore Primary and Secondary schools, Junior Colleges, ITEs and Polytechnics since 2000. The objectives of this programme are to provide the audience with the opportunity to appreciate the beautiful and soothing sounds of the harp as well as to gain an insight into the history of harp development. Besides performing a repertoire ranging from classical to popular pieces, Magdalene will talk about the History of Harp Development and show a 7-page PPT presentation which consists of pictures of ancient and modern harps with explanatory text.